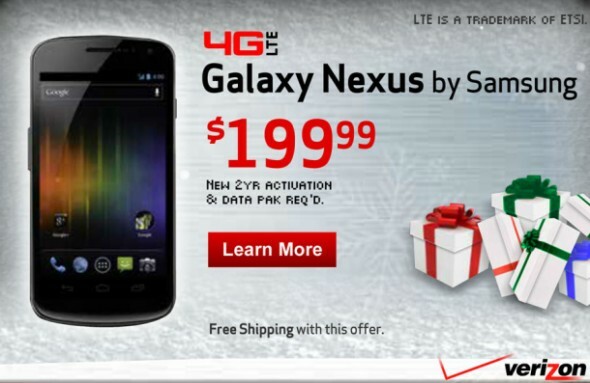 Although the actual release date of the Galaxy Nexus in the US has yet to be confirmed, the above holiday-themed ad has surfaced. The Verizon advertisement has the 4.65-inch Super AMOLED and Android 4.0 carrying Samsung Galaxy Nexus going for $199.99 with a two year contract on the company’s 4G LTE network. The Galaxy Nexus has already been released in the UK, though a strange ‘volume bug‘ meant that the launch didn’t go as smoothly as Google and Samsung would have wanted. The UK HSPA+ version of the Galaxy Nexus has 16GB of built-in storage, whereas the Verizon LTE Nexus would have 32GB. More storage is always welcome, especially since the Galaxy Nexus doesn’t have a mircoSD slot.